Recession in 2020? Technical or Fundamental? If you have been reading the headlines lately, something would have come to your attention, several prominent economists and investors are calling for a recession in the year 2020. Market is a product of many participants, some trade on Fundamental grounds and some trade on Technical or a combination of both. 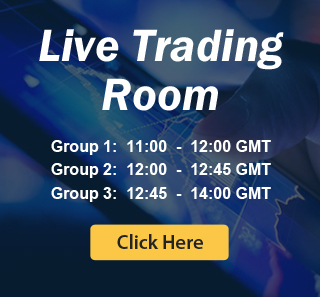 Many keep calling and saying that only Blue skies are ahead for the US Economy, many believe the US President is responsible for the latest rally in the US Indices and many of the big stocks. The Fundamental argument is that the latest economic expansion is too good and consequently will leave Federal Reserve with no other choice but to raises Interest rates to cool the economy down which can creates the housing market to slow down and also investors and consumers to get out of the long side. We are seeing all time records low in unemployment and rising wages which should create inflation and again pressurise the FED to raise interest rates, a lot of speculations there, Honestly, it can happen and even when we do not follow or use Fundamentals in our trading, we understand how it works, but when we see the Technical analysis supporting this argument, it gives us more conviction For years, we have been telling members at Elliottwave-Forecast.Com that something will happen in 2020, either a Financial crisis or a US Constitutional crisis, we don’t know exactly what it would be and we are not in the business of guessing that either. 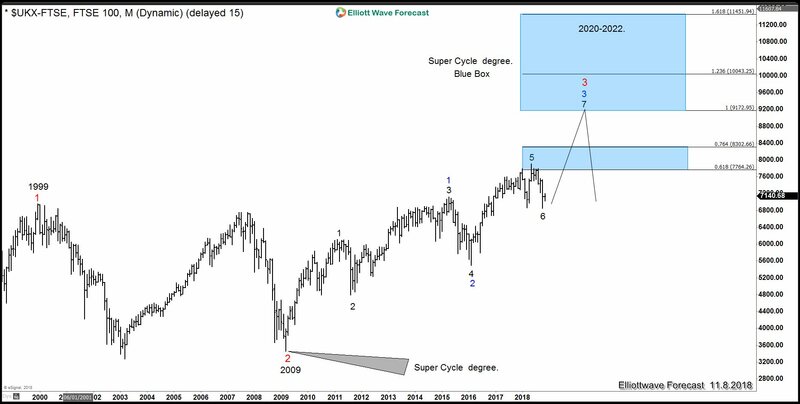 We believe that World Indices will end the cycle from 2009 at sometimes around 10.2020 in which case a Mid level correction will take place or a huge correction, the degree is unknown, Indices like $XJO-ASX which is the benchmark of the Australian equities will be the key to determining the degree, the Index should be reaching the 7322 area by 2020 and breaking the peak at 2007 will create a Bullish sequences against the low at 2009 and then Bulls will be in control. 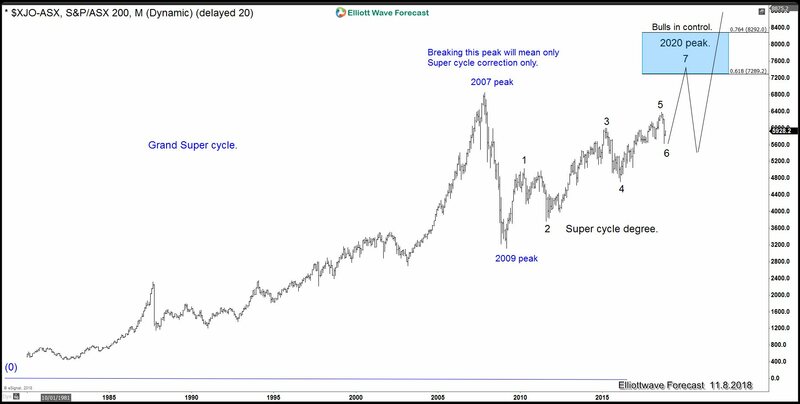 The Following charts show the Grand Super cycle and the Super cycle in the Index. Please note that numbers represent swings count and not Elliott waves count. Now the question is why 2020, the idea is simple, the Market, even when many don’t believe, follows a natural code, which off course is related to the Golden ratio which we have explained in the Gold ratio sequence article in the past. 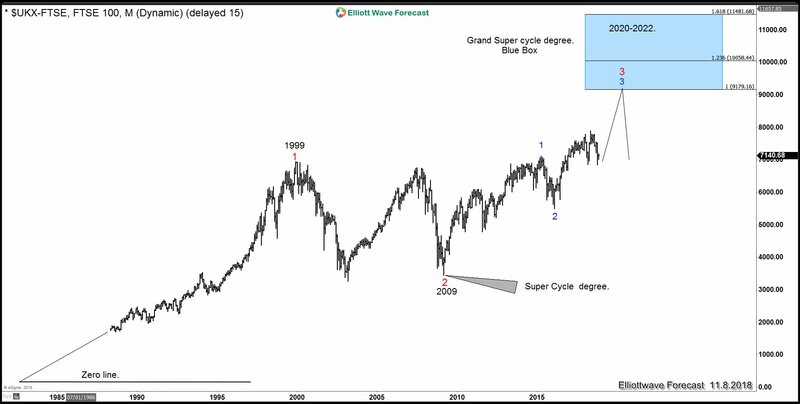 The code is visible in 1 minute time frame and even at the Yearly higher degree cycles, 2020 is a time, when many Indices across the world will reach the 100% extension in the Grand Super cycle like we are showing in the chart below the $UKX-FTSE which is presenting the Blue Box within the Grand Super cycle, a reaction lower will happen from the Blue and minimum Super cycle degree will be corrected. We are seeing a perfect alignment in price and time around the same time, most of the times when that happens, a cycles ends, we are seeing many Indices with the alignments, look at the following chart of the $UKX-FTSE which is showing 5 swings from 2009 low and needs to trade higher into 7 and into the Blue Box which is the 100% extension within the Super cycle and a reaction lower will happen from there which could coincide with a possible recession in 2020. The following chart shows the idea within the Super cycle degree. The following chart is showing the time aspect, the 100% in time will be reached around the time for the US General Election. Cycle degree from swing 4 in Black took 23 months and the 100% in time is 9.2020 which very close to the US General Election. The Technical trade is calling for a peak around 2020, so even when many economist across the World are seeing the Fundamental side of 2020, their case is further supported by our Technical analysis. We believe something will happen between 2020-2022 which will cause the slow down and a possible recession. 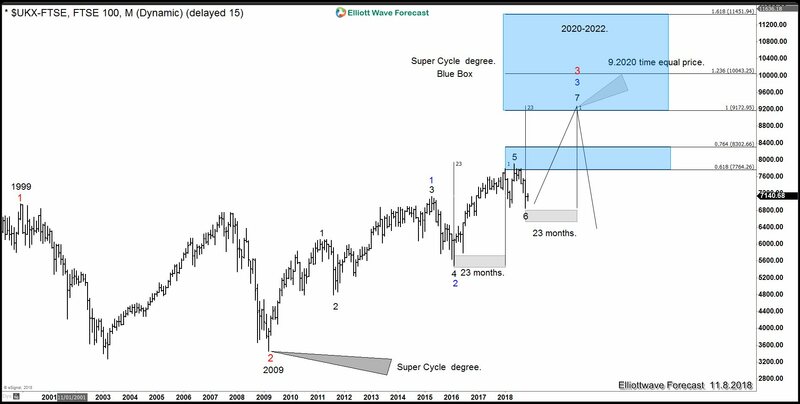 We highlighted the importance of 2020 – 2022 back in February 2018 also in this article: World Indices: What will happen in 2020-2022 Something will happen, but until then another Bulls should remain in control for another 22 months.